Section 3 of the Housing and Urban Development Act of 1968 recognizes that HUD funding typically results in projects/activities that generate new employment, training, and contracting opportunities. When these opportunities are created, Section 3 requires that preference is provided to low- and very low-income residents of the local community (regardless of race and gender), and the businesses that substantially employ them, for new employment, training, and contracting opportunities resulting from the HUD-funded project. What Triggers Section 3 Requirements? Dollar thresholds: contracts over $100,000 are required to comply with Section 3 requirements. Section 3 regulations do not require hiring or subcontracting unless it is necessary to the project. Section 3 is triggered when covered projects require “new hires” or subcontracting. 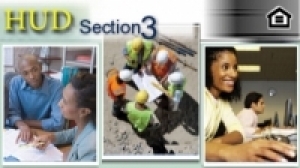 Section 3 is not an entitlement; it is an opportunity for employment, training and contracting opportunities. Each entity undertaking work under a contract that is $100,000 or more must submit a Section 3 Plan. This plan must include, at a minimum, the General Statement, the Current Workforce Profile and Hiring Plan, Permanent Employee Listing, and Quarterly Reporting of Section 3 initiatives. Ten percent (10%) of all covered construction contracts shall be awarded to Section 3 Business Concerns. Three percent (3%) of all covered non-construction contracts shall be awarded to Section 3 Business Concerns. Efforts to meet these goals must be made to the greatest extent feasible and all efforts taken must be documented accordingly. Section 3 Resident: A public housing resident or an individual who resides in the metropolitan area or non-metropolitan county in which the Section 3 covered assistance is expended and who is considered to be a low- (80% of AMI) to very low-income (50% of AMI) person. Persons must be certified as Section 3 Residents to count toward the goals listed above. Certification lasts for a period of 3 years. Section 3 Business Concern: Fifty-one percent (51%) or more of the business is owned by Section 3 Residents; or Thirty percent (30%) of the business’s permanent, full-time employees are certified Section 3 Residents; or The Business provides evidence that it will subcontract 25 percent (25%) of the dollars awarded to certify Section 3 Business Concerns. Businesses must be certified as a Section 3 Business Concern to count towards the goals listed above. Compliance Requirements: Each entity undertaking work under a contract that is $100,000 or more must submit a Section 3 Plan. This plan must include, at a minimum, the General Statement, the Current Workforce Profile and Hiring Plan, Permanent Employee Listing, and Quarterly Reporting of Section 3 initiatives. For information regarding Resident or Business Concern certification or Section 3 procedures, please contact Melissa Berrien at mberrien@rochesterhousing.org or 585-232-1112 ext 229. Click here If you are interested in being considered for employment and fill out our Employer/Employee matching form.